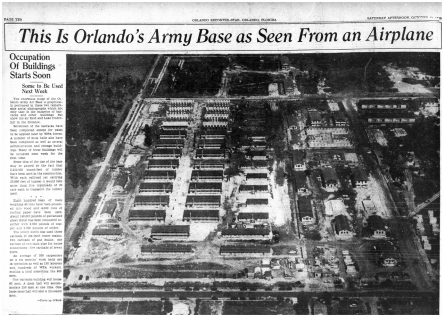 ORLANDO Air Force Base has been an integral part of the Central Florida community since August, 1940, when the first troops rolled in by truck convoy. At that time the municipal airport was taken over by the Army Air Corps and vast construction programs were begun. Officially opened on December 1, 1940, the base became the center of the Interceptor Command School. First base commander was Col. Thomas Voss, who is credited with the general layout and landscaping on the base. During the following two years, additional lands were obtained and auxiliary landing fields were built in the surrounding area. Operations through the war years beginning in November, 1942, were centered around the Army Air Forces School of Applied Tactics, commanded by Brig. Gen. Hume Peabody. Selected air crews were given advanced training here in the latest bombardment methods and tactics. Also, an Air Defense Department was established to train fighter pilots in the techniques of defense against air bombardment attacks. 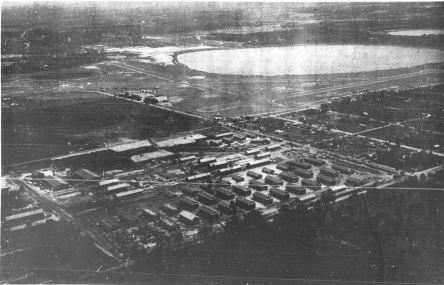 Following World War II, the base served as a separation center for thousands being returned to civilian life. The headquarters of the Provine Ground Command was centered here until July 1, 1946, when this unit moved to its present location at Eglin AFB, Florida. Reactivation of the 14th Air Force in 1946 brought the headquarters of the famous “Flying Tigers” to OAFB. A unit of the Continental Air Command, the 14th remained here until the base was deactivated on October 28, 1949. After remaining on a standby basis for over two years, the base was reopened on January 1, 1951, as an aviation engineers training sight [sic] again under the direction of the 14th Air Force. Today’s  face of the base began to take shape on November 5, 1952, when Headquarters of the Air Photographic and Charting Service was moved here from its previous home in Philadelphia, Pa. With the completion of the move, APCS was assigned to the Military Air Transport Service and occupied its new home under a joint agreement between MATS and ConAC. Full jurisdiction of the base was given to MATS on July 1, 1953, and the 1360th Air Base Group was formed to provide logistical support and services to the many Air Force units that were to occupy OAFB. Additional MATS units were attached to the base when, in April, 1954, the headquarters of the Air Rescue Service and Flight Service were moved here. Flight Service was later moved when it was integrated with Air and Airways Communications Service in 1956. Another MATS unit, the 1380th School Squadron operating the command’s Non-Commissioned Officer Academy, was organized in May, 1955, and assigned to APCS. The first class of NCOs was graduated on October 3, 1955. The first Tactical Air Command unit moved to the base in September, 1954, putting OAFB into the missile age. It was the 11th Tactical Missile Squadron, formerly known as the Pilotless Bomber Squadron, which began the training of crews to operate the TM-61 Matador guided missile. Later integrated into the 701st Guided Missile Wing in Europe, the 11th was replaced by the 17th TMS on September 8, 1955. Since that time the missile activities have expanded into the present 4504th Missile Training Wing. Other units located here recently for service, logistical and administrative support are the Orlando Air Procurement District of the Air Materiel Command; the 9186th Air Reserve Training Group; the 1278-2 AACS Detachment: .the 3415th Technical Training Group; OSI (IG) USAF, Detachment 703; area office for the USAF Auditor General; and the AF-CAP Liaison Office, Florida Wing.